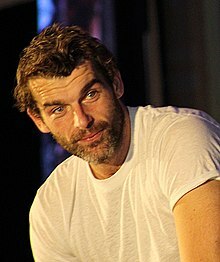 Stanley Weber (born 13 July 1986) is a French actor and theatre director. He is known for his performance as Juan Borgia in the television series Borgia, and for his roles in films The First Day of the Rest of Your Life and Thérèse Desqueyroux as well as Violette. Stanley Weber (L) and Andrew Gower (R) answer questions during their panel at Creation Entertainment's Outlander convention in Las Vegas on 15 July 2018. Stanley Weber was born on 13 July 1986 in Paris, France, to actor Jacques Weber and his wife Christine. He has a sister, Kim, and a brother, Tommy. Weber received his first acting lessons at Cours Florent, and then enrolled acting at the Conservatoire national supérieur d'art dramatique. He also studied at the London Academy of Music and Dramatic Art. Agatha Christie's Poirot Count Andrenyi Philip Martin Episode: "Murder on the Orient Express"
The Hollow Crown Duke of Orléans Thea Sharrock Episode: "Henry V"
^ "Anciens: Les acteurs". Cours Florent (in French). Archived from the original on 5 November 2012. Retrieved 4 February 2013. Wikimedia Commons has media related to Stanley Weber.